Most galaxies can be categorized by their shape. Our own Milky Way is a spiral galaxy, for example, and the largest galaxies in the Universe are elliptical galaxies. But some galaxies defy categorization. These are the irregular galaxies, and each one is unique in shape, age and structure. Irregular galaxies are often chaotic in shape, with no central bulge or spiral arms. Although they used to have a more familiar shape, a dramatic collision with another galaxy has distorted their shape. Astronomers maintain two classifications of irregular galaxies. Irr-I galaxies have some structure, but they’re still distorted enough that they can’t be classified as spiral, elliptical or lenticular shaped. Irr-II galaxies don’t have any structure at all. The nearby Magellanic Clouds were once thought to be irregular galaxies. Although astronomers have detected a faint barred spiral shape. There’s only one irregular galaxy in the Messier catalog of objects, and that’s M82; also known as the Cigar Galaxy. It’s located in the constellation Ursa Major about 12 million light-years away, and is famous for its heavy amounts of star formation. 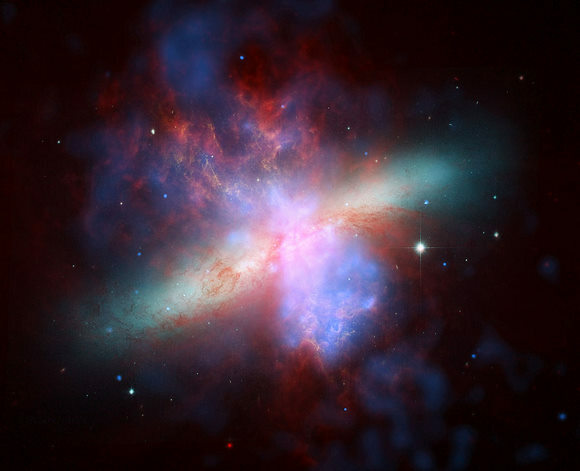 In fact, in infrared light, M82 is the brightest galaxy in the sky. Even in visible light, it’s 5 times brighter than the Milky Way. We have written many articles about galaxies for Universe Today. Here’s an article about Hubble’s recent image of irregular galaxy M82.